Get your players working together with this team session - perfect for building team chemistry and preparing your players for their next big game! 1 offensive player and 1 defensive player. The ball will be thrown up at the basket. The defensive player must go make contact(box out) the offensive player and get the rebound. Once the defensive player has the rebound, they pass back out to the shooter. 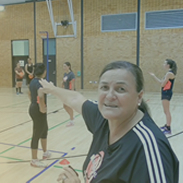 The drill rotation is offence to defence, the defence goes off to the back of the line.